When religious zealots establish the New Vatican, rebel forces escape to the outskirts of Northern Canada. These political acts set the stage for Darcy Van Poelgeest and Ian Bertram’s LITTLE BIRD series from Image Comics. LITTLE BIRD plays with conflicts. The artificial and colonizing New Vatican threaten the natural world on multiple fronts. While the resistance works in cycles of death and rebirth, the colonizers hold manically to a constructed linear path. Little Bird, the young daughter of a resistance fighter, finds herself at the center of the conflict. As a figure of the resistance, she is repeatedly resurrected to serve in the war against mass cultural oppression and ecological destruction. 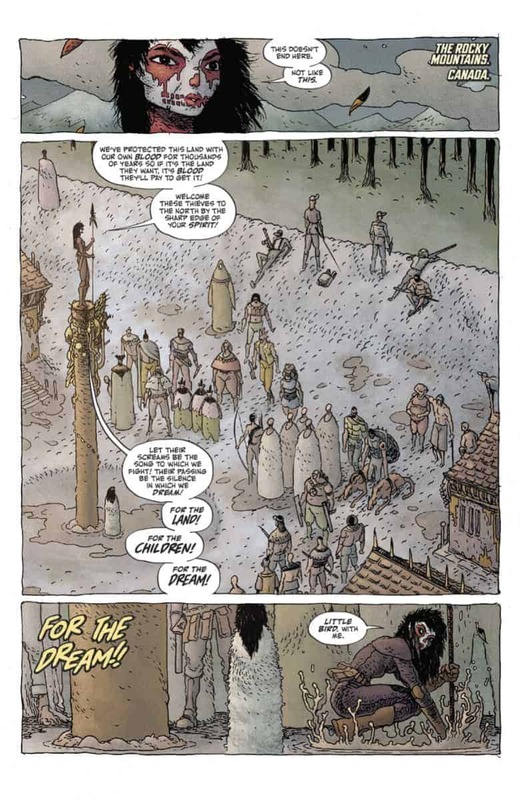 As a result, the comic is a fascinating and gruesome exploration of violence and determination. ComicsVerse is thrilled to have the opportunity to speak to LITTLE BIRD creators Darcy Van Poelgeest and Ian Bertram. 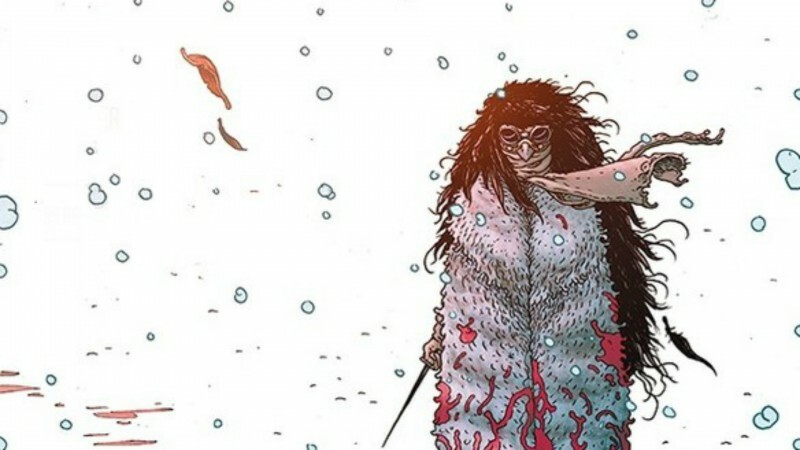 Darcy and Ian share their thoughts on comics, violence and surrealism, and their experience collaborating on LITTLE BIRD. 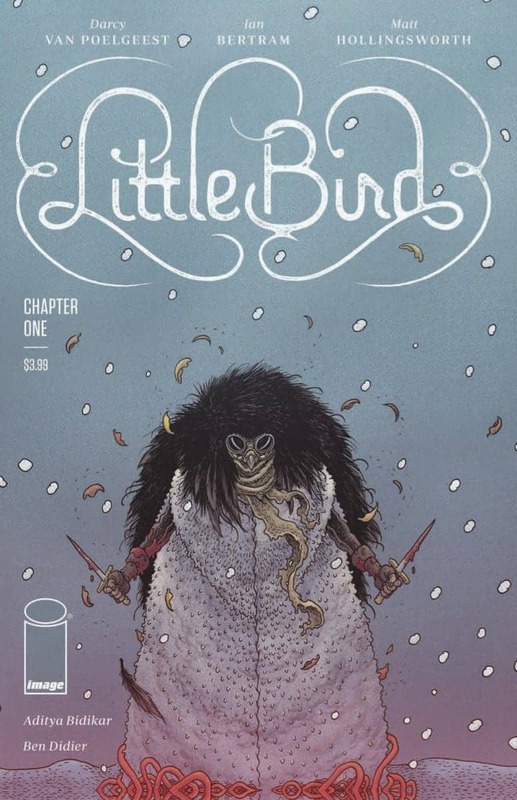 ComicsVerse (CV): Thank you for taking the time to talk to us about your new series, LITTLE BIRD. Can you tell our readers what they can expect from LITTLE BIRD #1? Darcy Van Poelgeest (DVP): You can expect quite a lot from the first issue! You are immediately dropped into the story. Little Bird, her mother Tantoo, and the rest of their village scramble to prepare for the worst as Bishop’s soldiers storm the mountains looking to extinguish the last bastion of the Canadian Resistance. 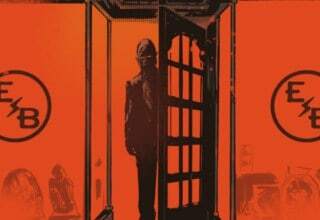 The first issue sets things up in terms of characters and the world but it also contains its own story. Each issue is like this where there’s a beginning, middle, and end but at the same time we’re moving toward something bigger. Ian Bertram (IB): Overflowing tentacle bathtubs, mayhem, snow, blood, and a girl trying to navigate a world that seems poised against her. CV: Darcy, you have had a tremendous career in screenwriting and directing. What made you shift to comics for LITTLE BIRD? How did the process differ from your work in film? 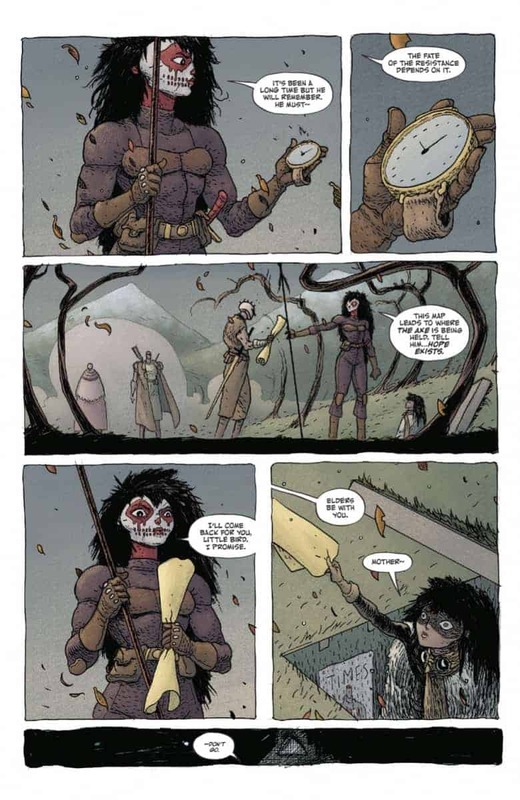 DVP: LITTLE BIRD is my first book and it was a really slow and natural process, and I don’t recall making a decision to shift to comics — it just sort of evolved that way. I haven’t stopped making films either. I do know that I’d become frustrated with having to think small when it comes to making films — particularly making Canadian films. 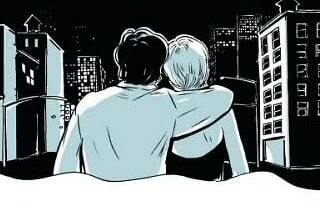 Making comics is a much more intimate process than filmmaking but it allows you to dream big. You’re communicating your ideas to a smaller group of collaborators and I’d say that frees you up in a really great way, creatively. Making a film can be a long series of compromises — the reality of production can whittle an idea down pretty quickly whereas with a comic, at least in my limited experience, it keeps growing. It keeps blooming in really interesting and unexpected ways. This can be true for films as well. I’ve experienced that, but it’s more of a grind to protect that idea and not let it get away from you. 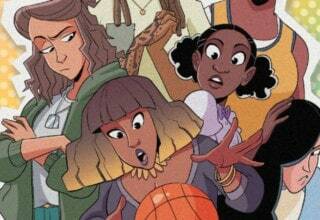 CV: In LITTLE BIRD, you draw on themes of religious oppression and American colonial history. Indeed, you juxtapose this with Little Bird and the Resistance fighters that feel closely tied to the natural world and possibly Indigenous histories. Can you tell us about how you arrived at your antagonists and protagonists’ identities? DVP: When I look around at everything that happening in the world today I find great hope and great despair. It’s so clear to me that religion and politics have been weaponized to hold onto power. They always have been. At the same time there are large groups of people — often led by indigenous communities, often women — standing up and speaking up in opposition to these harmful ideas. There’s a conflict there and it’s a conflict that has been going on for hundreds of years. It’s a conflict that people often try and dismiss as history but it’s not history. It’s happening right now. I think pushing that conflict into the future in a twisted, sci-fi setting is an interesting way to look at it. So we’re exploring that idea. IB: I tried to reflect this in the designs of the characters and their settings. We see a “New Vatican” built of symmetrical stone blocks, and a village strapped together by outcasts. The Vatican is strict and rigid — unable to bend or change. The village is constantly adapting, fluid, and easier to uproot. CV: Can you tell us more about your small heroine, Little Bird? Why is she at the center of the resistance? DVP: Little Bird being at the center of the resistance isn’t anything she chose and that’s an important part of the story. She was born into this war. This story is as much about her processing that and trying to figure out what to do with that as much as it’s about the more external conflict of war and an oppressive government. CV: Along with your already strong characters, the universe in which they live is extremely vivid. Indeed, the overall affect is exciting and intense. How do you see the cyborgian elements coming into conflict with the wilderness? DVP: This future is one where a segment of the population who have been marginalized over a long period of time has moved into the wilderness both as a form of protection and shelter but also to protect the relationship they have with the land. It’s a symbiotic relationship that they want to maintain and technology has become disruptive to all of that. IB: I think the ‘mods’ as we call them, represent an environment shaped and changed by human hands. Humans were altered (modded) as a form of self-expression. And that expression was seen as yet another symptom of moral failing by the Vatican. In the upcoming chapters we get to see how the world itself has been both made beautiful and punished by human hands. CV: Ian, your artwork is intensely detailed and surreal. Overall, LITTLE BIRD is very violent and gory. How does body horror and surrealism play a part in your world building? IB: Thanks! Aaaand the world building really was a treat. I just kind of ran wild. Without giving too much away, there’s a prison that houses people too strange for the world. And it’s basically an all out free-for-all of insane character designs. As far as the interactions between horror and the surreal, it’s something I always play with. In LITTLE BIRD, they operate as counterweights. The Surrealism allows for the world to operate by its own strange logic, and the horror tethers it to our reality with a visceral snap. CV: Little Bird’s mother, Tantoo, is particularly wild looking while the religious zealots are gruesome cyborgs. As a result, you achieve fascinating combinations and juxtapositions. How did you develop your character designs? IB: I had such a great time designing these characters. I wanted Tantoo to be a fighter. Not just fight, but look like she is capable of throwing punches and kicks and would break bones. She’s got muscle and speed in her design. The scars on her face are an immediate indicator that she’s not to be underestimated. But I hope her posture tells us that she is unbreakable. In contrast we have Bishop. He’s vain, and broken, and guided by “god.” We see him proud for the masses, and hunched and regretful at all other times. He’s such great character to work with. And the Zealots were the most devoted priest warriors, turned into flesh soup and poured into the bodies of murderous robots. It’s insane, and operates based on its own weird science. CV: Critics often point out comics’ use of violence. Some of the scenes in LITTLE BIRD #1 are surprisingly brutal. Can you tell us about the function of violence in your story? How does picturing the trauma add to your narrative? DVP: When these moments of really graphic violence bump up against quieter, more reflective moments it magnifies it in a way that feels very disruptive to me. I’m not sure what to say about that but it’s in my film work as well and Ian does an incredible job of exploring violence in a way that feels like sculpture. It exposes us in a really exciting and uncomfortable way. CV: How has it been working together on such an ambitious story? DVP: Total hell! Haha. No, it’s been one of the greatest and most rewarding experiences of my life! For whatever reason I think we’ve inspired a commitment both to the story and each other’s work. I think that shows on the page and I hope readers can see that as well. LITTLE BIRD has been a massive undertaking but it been very rewarding and I’m getting excited to share this with a larger audience. IB: It’s incredible. A true collaboration. It’s the first project I’ve worked on where I’ve gotten to help craft the story. And seeing how Darcy weaves dialogue through the insanity of some of my drawings lends the book this poetic aspect that I never really thought my work inspired. It’s a beautiful juxtaposition. DVP: When I was just a very young lad (way too young to be there) my grandfather who was writing a film review column at the time took me to the movie theater to see David Lynch’s DUNE. By the time the doctor had poked through the second boil on the Baron’s face, my grandfather had already grabbed my hand and was unceremoniously ushering me out of the darkness. But it was too late… I’d seen it. 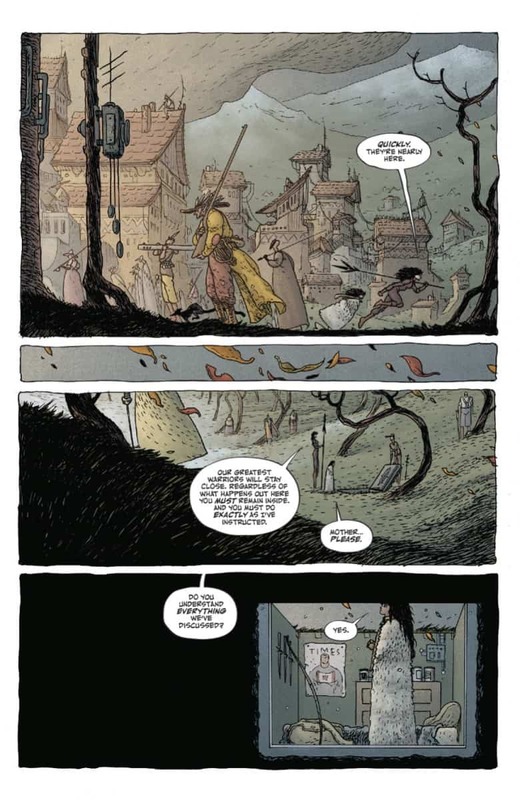 IB: I’m hugely influenced by Moebius and Otomo, I think those are pretty apparent ones. During LITTLE BIRD though, I intentionally avoided reading other comics. It was an attempt to try to find my own way of storytelling, layout, and pacing. It also meant that I was drawing on a lot of subconscious images and trying to flesh them out. Obviously they are influenced by my experiences, but it’s harder to pin down which ones, and I like that. Feels freeing. CV: Are there any other projects that you’re working on that you’d like to tell our readers about? DVP: Yes! Ian — Can we tell them? Can we?! IB: Ooooo, we should! We should! DVP: All I’ll say for now is that the answer to this question lies in LITTLE BIRD #3. Thanks again to Darcy and Ian! LITTLE BIRD is available March 13, 2019 from Image Comics. Reserve your copy here!